3/19/2011 - Some ideas take longer than others. 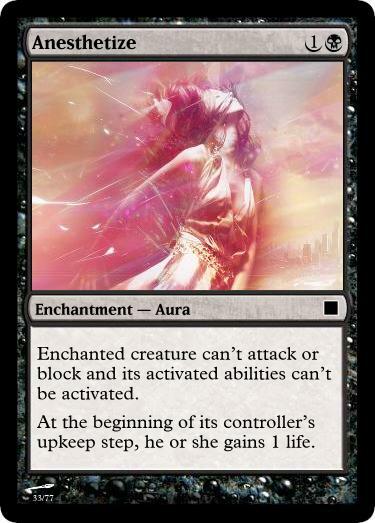 I found this art and knew it needed to go on a black spell named Anesthetize about a month ago. The text I put around it was very 'eh,' (it was a Pillory of the Sleepless that gained you life instead of losing your opponent life), which is why you haven't seen it until now. I came back to it today and tried a few new angles of attack until I found one that's actually interesting. Unfortunately, it's so interesting that it's already been printed—and with identical stats, no less. For what it's worth (very little), I do prefer the flavor of Anesthetize over Treacherous Link. Going back to the original idea—and trying to grasp with how efficient a black Pacifism should be—I decided to make the upkeep trigger a drawback that would allow you to cast an Arrest for less. Now, it could easily be that this kind of effect just plain doesn't belong in black, but it at least makes thematic sense. I'm not going to lie, this is not an exciting card. But it is a card. Maybe this would be a good segue into discussing why they print terrible cards. Or maybe we should just move on with our day. I wonder if it would be more interesting/usable if it made its controller lose 1 life, rather than make the opponent gain 1. It's more fitting with black's tradition of paying life in exchange for undercosted or color-bleeding effects. Your original Anesthetize design sounds a lot like Recumbent Bliss. Wizards has obviously tried pretty hard to mine this space, so props for finding a new one! It may not work in mono-black, though. What about Demonic Cage; WB; Enchanted creature can't attack or block, and its activated abilities can't be played. 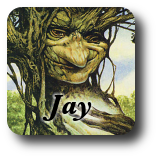 It gains "At the beginning of your upkeep, this creature deals 1 damage to each player. "?